Samuel Simpson wrote from Lawrence, Kansas Territory to Hiram Hill. Simpson reported to Hill that the Topeka Legislature had recently been dispersed by U.S. Troops under order of President Pierce, and that southern emigrants were coming into Kansas Territory by "hundreds" while the northern emigrants found themselves forced out by proslavery supporters. 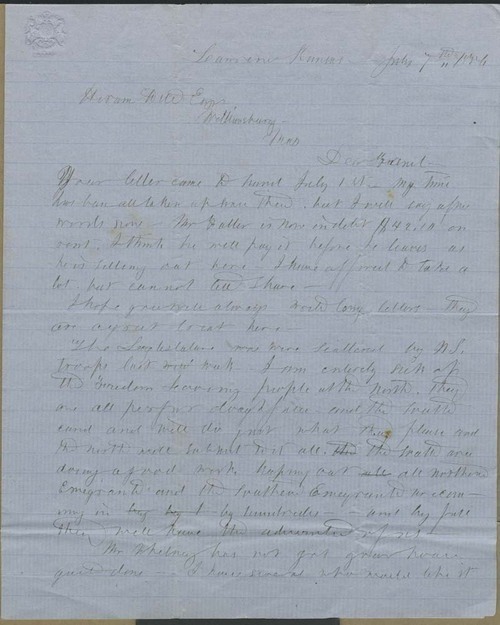 Short on time, Simpson kept his report regarding Hill's properties short; Whitney had almost finished his home, offers had been made on various lots, Mr. Fuller continued to be a problem.